With the world’s largest selection of gifts at your fingertips, an Amazon registry lets you dream bigger. Plug into the latest tech, outfit your grandest outdoor adventures, or stock your dream kitchen – nothing is out of reach. 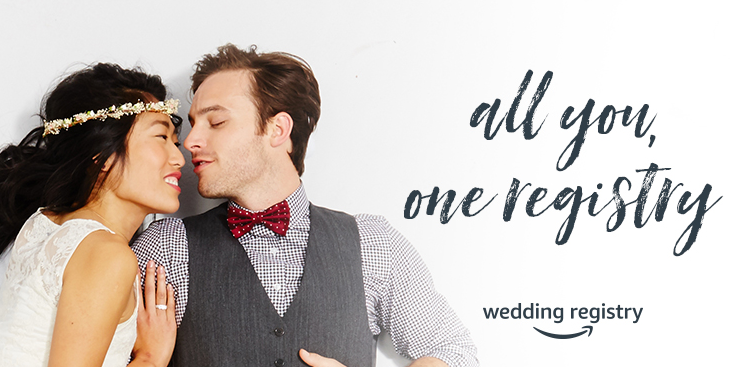 Sign up for an Amazon Wedding Registry for 20% Off & Free Gifts. You can explore fun wedding registry ideas for creating a shared space you adore, enjoying your hobbies together, or trying something totally new. Let your heart lead the way to a wedding registry that feels like a wish list for your wildest dreams. After your event date, enjoy a one-time 20% one-time discount for Amazon Prime members or 10% discount for non-prime members on items shipped and sold by Amazon. If you aren’t an Amazon Prime member, now would be an awesome time to join! The promo code expires 90 days after the event date so you’ll have plenty of time to use it. Save up to $200! Select merchandise vendors offer Free Bonus Gifts when a guest spends a certain amount on a specific eligible brand. The bonus gifts include additional FREE merchandise from that same brand. Keep track of what you want from anywhere. Add from other websites to your Wedding Registry with the universal button.